What is about trains that are so cool? Is it the roaring engine chugging down the tracks? The billowing smoke that puffs in the air? Or maybe it’s that all familiar, echoing whistles? In any case, trains have always possessed a certain kind of magic that sparks imagination and endless possibilities in the hearts of children for generations. As a young child, I remember getting my first taste of this magic when my father bought me and my older brother our first model train set. I have many fond memories of assembling that train set and pretending to go off to faraway lands. 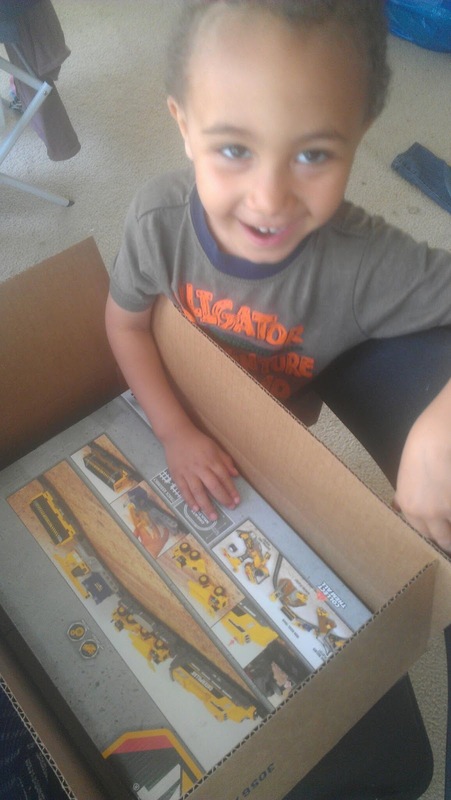 Because of this, you can only imagine my happiness in learning that my son also shares my love for trains. From Thomas the Tank Engine, to The Little Engine that could and even to the hibachi chef that creates a smoking train out of a stack of onions, it has been a blast for me to watch his interest blossom. The first thing that struck me about the train set was the realistic look. Visually, the pieces look exactly like the larger scale Caterpillar trains that you would see at most construction sites. 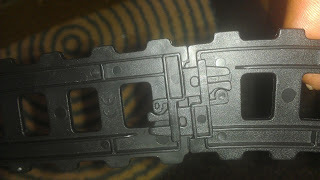 The set itself is made of plastic, which is far removed from the die cast of some higher end train sets; they certainly couldn’t take too much of a beating. My son and I then laid out the 7 feet of track, which in my experience with other toy sets is about the average length. On the front of the box, the company advertises that the set is “easy to assemble”. The term “easy” I suppose can be open to interpretation. While the design of the tracks were simple enough, they took a little more elbow grease to make each one snap together than I probably would have liked. 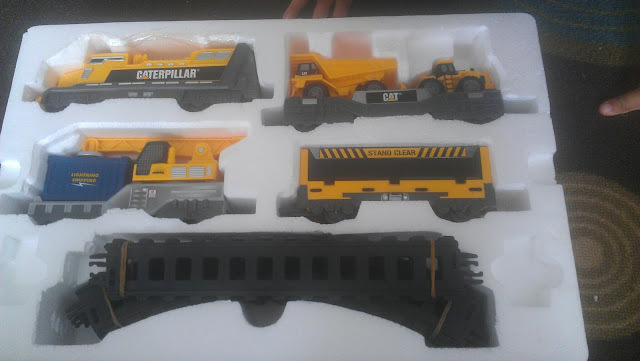 In an ideal scenario, my child should be able to pull the train out and assemble the tracks himself. 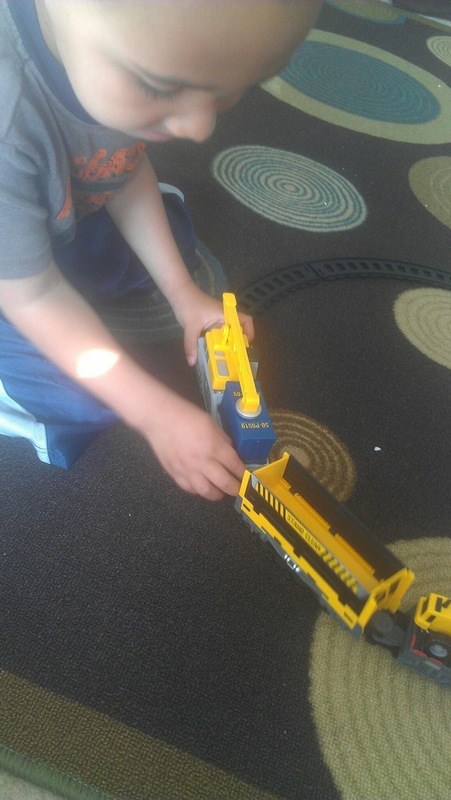 I would advise that you do take the time to show your child how to ensure the tracks are connected correctly., because if the tracks aren’t aligned just right, there’s a strong chance that the train will derail. While that isn’t a complete deal breaker, it’s something to keep in mind. While the tracks might be a slight hindrance, there are plenty of other features that are pretty simple. The first of which is the motorized engine, which runs on (2) AA batteries. The bottom of the engine unscrews with a Phillip’s head screwdriver and once the batteries are inserted, you push the red button on top and it pulls the 3 other cars around the tracks. It doesn’t make the bell and whistle sounds that some train sets make, but depending on what you are looking for, that may or may not be an incentive to purchase (Hey, some parents like a quiet toy in the house every once in a while). The individual features of the others cars are fun and easy to use as well. 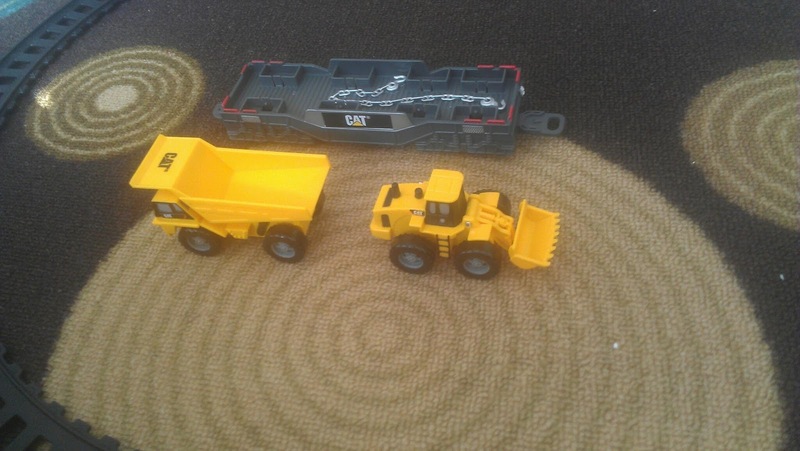 As I mentioned in the beginning, the transport car comes with a mini dump truck and backhoe, both of which easily detach from the transport care and are operational. The magnetic crane is pretty cool and easy to operate too: It comes with a boxcar that you can pick up and move around with the crane. The loading car has a hinge that pulls out and snaps back together. My son really enjoyed putting random items in it (matchbox cars, action figures, etc.). After a while, we decided to go “off the rails” (excuse the bad pun) and tried to find creative ways to play with the train. 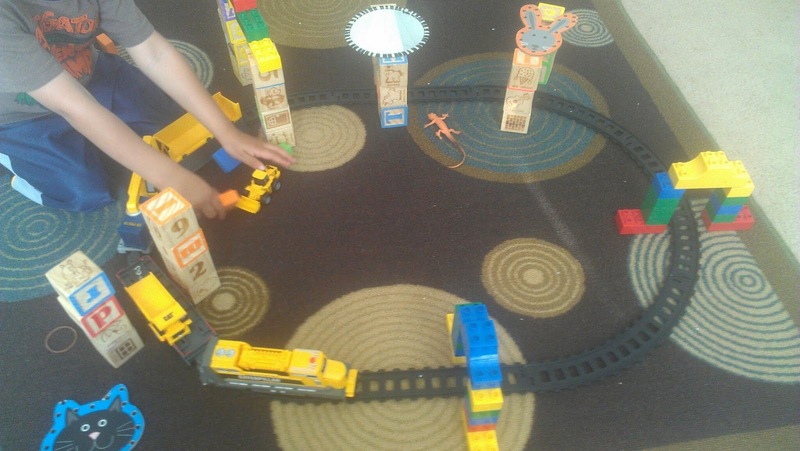 We used action figures, toy cars and block sets to build additional bridges and landscapes.However, if interested there are additional play sets available for purchase that will provide hours of additional play. Overall, the Caterpillar Iron Diesel Train Set is a great buy. The durability concerns a parent might have are offset by the low price, multiple features and relative ease of use. 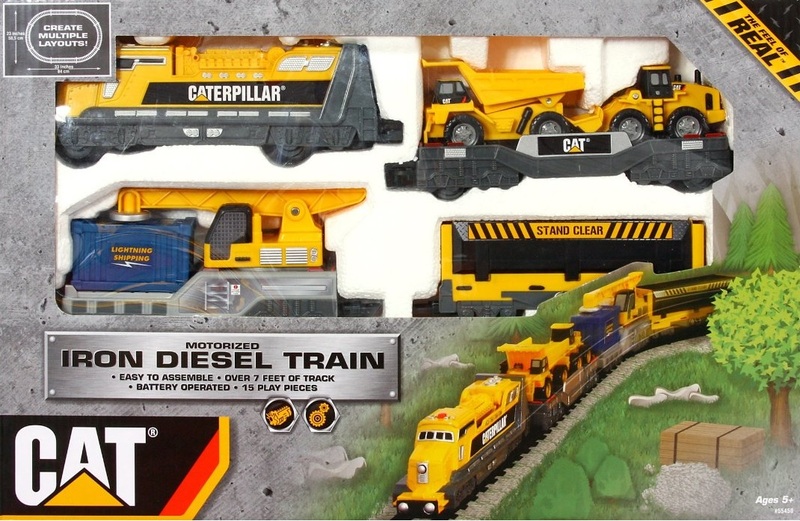 I would absolutely recommend this set to a parent who has a child who has fledgling love for trains, but is not quite mature enough for the larger, more expensive trains that are on the market. This toy can be purchased at multiple locations, including Target and Amazon.